Primary thallus: squamulose, persistent; squamules: 1-2 x 1-1.5 (4) mm, crenate to irregularly crenulate to lobulate-laciniate, esorediate, with shiny upper side podetia: up to 5 cm tall (usually much shorter), 1.0-1.5 mm wide, green to glaucescent, or brownish, subulate, without cups, unbranched to sparingly branched surface: ecorticate to slightly corticate at base, esorediate (but sometimes granulose in part), microsquamulose; microsquamules: fragile, projecting downward, inner stereome translucent, pale to dark brown Apothecia: fairly common, 0.5-4 mm wide, red ascospores: fusiform, 10-13 x 5micro meter Pycnidia: common, turbinate, short-stalked, with red gelatin conidia: falciform, 5-7 x 1 micro meter Spot tests: K- or K+ yellow, C- & KC- (or C+ & KC+ yellow if barbatic acid present), P- or P+ yellow, UV- Secondary metabolites: thallus with two major chemotypes: (1) didymic and barbatic acids (rarely only one of them) or (2) didymic and thamnolic acids (rarely with accessory barbatic acid) with only the first one known in the Sonoran area; apothecial discs with rhodocladonic acid as a red pigment. World distribution: Africa, Asia, Australasia, North America and South America Sonoran distribution: only known from one location in the Sierra Madre Occidental region of Sinaloa. Notes: This species is common further south in Mexico. It is very similar to C. macilenta (they may grow together!) 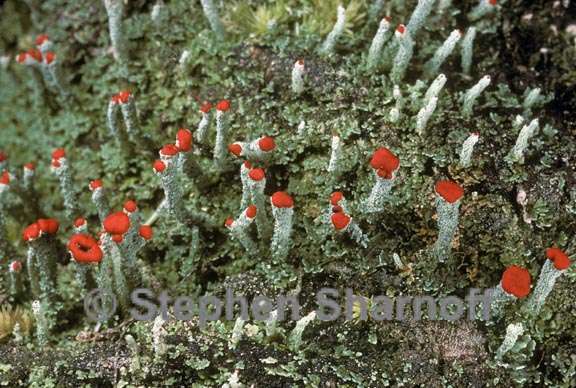 but the latter species has farinose soredia, while C. didyma has rough microsquamules or granules and is not clearly sorediate. The thamnolic acid chemotype, which is the more frequent one in Mexico (see maps in Ahti , pp. 196-197), was commonly recognized earlier as a distinct species (e.g., Thomson 1967, usually under the name C. vulcanica. For more data on the chemical variability of this species see Ahti (2000), p. 195.